Eddie Hackett has long been considered Ireland’s foremost golf course designer yet he was in his mid-late fifties before designing his first eighteen-hole course. Eddie started out as an amateur at the Hermitage Golf Club before taking up golf as a professional career. Eddie started as an apprentice/assistant to Fred Smyth, the famous clubmaker, in Dollymount and spent five months in Belgium with Henry Cotton at Waterloo and nearly a year with Sid Brews in South Africa. Eddie succeeded Willie Nolan as professional in Portmarnock in 1939 from his position as professional at Elm Park. Eddie’s assistants included Jimmy Doran (renowned clubmaker), Joe Nagle, Cecil Connolly and Christy Greene who was attached to Portmarnock between 1946-1950 before moving to Milltown. Hackett wrote a newspaper column in both the Irish Press and later the Irish Independent. During the war Eddie would arrange exhibitions matches and reportedly accumulated £300, no small sum during the war years, for donation to good causes. As a professional his successes were limited to the Michael Moran matchplay competition, being runner-up for two years in the 1940s, and the Irish Professional Championship in 1942 when he was runner-up to Harry Bradshaw. As a result of his training he was considered an expert clubmaker but it was for his instruction and knowledge on the theory of the game and the mechanics of the golf swing where his expertise was most in demand. 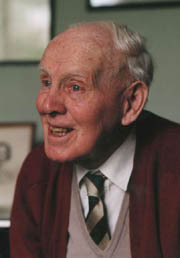 In 1948 he was made honorary secretary of the Irish Professional Golfers’ Association but one of his first acts was to deny an up and coming youngster from a place in the national championship being hosted by his home club, Galway Golf Club as later told to John Redmond in his autobiography, Christy O’Connor (Snr). J.P. Rooney had chosen Eddie, after witnessing his play, to provide instruction for the brassy (the modern equivalent of a two wood) in his book, ‘Play Good Golf’ which shows him in different poses wielding a brassy. His instruction basically espoused the easy three quarter- full swing with equipment suited for the purpose (whippy shaft, regular length and weight best suited to the golfer, male or female). The book includes photographs of Eddie in various stages of the swing to illustrate the proper execution of a brassy shot. When he left Portmarnock in 1950 he joined the amateur ranks retiring from professional golf as a result of illness and was made an honorary member of Portmarnock. Ironically he had taken the game up because of ill health. The Irishman’s Diary reported: “Eddie Hackett has no superior as a teacher of the game of golf in this country……There is little that he does not know about the theory of golf”. However he left his mark when his protege Christy Greene who at the time was moving to Kilcroney as another player, Harry Bradshaw, was taking up his position at Portmarnock. Christy won the Irish Professional Championship in 1956 and he gave no small praise to Eddie Hackett for his achievement. As a re-instated amateur Eddie played out of Foxrock Golf Club. In the early 1960s he was hospitalised with Meningitis as was advised by Bill Menton who was Secretary of the GUI (Golfers Union of Ireland) to take up golf architecture. In 1963 he announced his return to the professional ranks but as he was not affiliated to a golf club he made his services available under the Golfing Union’s Temporary Professional Scheme allowing clubs to avail of his services for short stints. 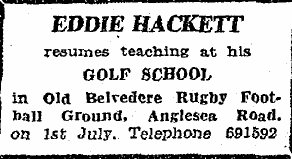 They started a free coaching project whereby Eddie would offer free coaching to the boys and girls of club members, while there was a lower limit of eight persons per group this didn’t seem to be an issue, by way of example, sixty people turned up when Hackett visited Belturbet. Eddie was offered a position at Foxrock which had lost Ernie Jones and was on the verge of losing their assistant ‘R. J. Browne’ but Eddie chose to continue with his coaching. By October 1963 he was considered Ireland’s leading teaching professional and the Irish equivalent of John Jacobs. In October 1963 he opened a golf school at the Old Belvedere Rugby and Sports Club, setting up mats and netting in their clubhouse. Also night courses were held between 7-10pm Mon,Wed and Fri. Eddie was also teaching at the Leopardstown school twice a week and coached the UCD Ladies members at their college gym in Earlsfort Terrace. It was around about 1965 when he appears to have first got into golf design in ernest as he was already coaching at Clongowes and Rockwell and they presumably asked him to lay out a number of holes in or near their college grounds. Since the mid-sixties his efforts were focussed in the area of course design which he appeared to have a natural aptitude for given his ability to weave a route through previously unchartered golfing terrain to produce a challenging golf course with the minimum of interference with the contours and topography of the area. It was a time when golf course architects were few and far between on the Emerald Isle and his reputation for being both reasonable from a cost perspective, a factor which can’t be underestimated in Ireland and the time and his ability to produce a quality product made his the architect of choice for new and re-designed golf courses. Eddie seemingly had a pact with Mother Nature to design courses with the minimum of disruption to her existing creation and this led to his involvement in nearly a third of the links courses in Ireland which represents nearly ten percent of all links courses in existence. His dedication to his work is reflected in the story where he offered, a cash-strapped Ballyconeely club, to mark out the tees and greens for the course for a pittance so they could produce the most challenging course possible. Although some of his courses have been tweaked or redesigned it is testament to his skill as a course designer that many are still listed on the top 100 courses in Ireland. “This Links have everything that St.Andrews has – and more!” Christy O’Connor Jnr. One of the best insights into Eddie Hackett as a man and architect is detailed in the classic book ‘Links of Heaven’ when Richard Phinney tried to get to know Ireland’s own “National Architect”, when he interviewed Eddie first hand and witnessed his approach to designing golf courses as they traversed the virgin territory that was to be an additional nine-holes at the Connemara Golf Club. Eddie Hackett died in the year the book, a seven-year long adventure, was published and the authors partially dedicated the book to him. Below is a list (not a complete list) of the courses which have Eddie Hackett’s stamp on them. Hermitage Golf Club – Drainage problem with signature hole tenth – estimated costs of 15k were vastly reduced when Hackett devised an alternative solution by raising the green two feet, making it bigger and moving it back towards the Liffey. Year*- The reference to year is a very rough estimate as the design process can take a number of years. 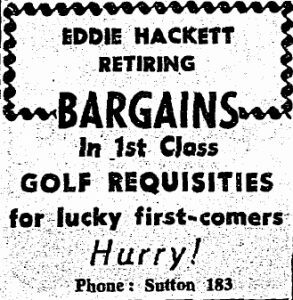 Eddie Hackett, a devote Catholic, died on 16 December 1996, reportedly with in excess of one hundred golf courses created, moulded or enhanced by his design skills. Fond memories still linger around the fairways of Ireland of his kind, self-effacing genius and ability to extract a challenging golf course from, in many cases, a blank canvas. He did what he loved doing, designing golf courses, to the very end and despite his ill-health throughout his life lived to a ripe old age. James .P. Rooney: Play Good Golf Published By The Kerryman Limited , Tralee .